In this post: popular sites, second market for sold out events. Let me save you some time buddy, signing up to these sites in not easy as a foreigner. It is possible only if you can read Korean, are running internet explorer, and have a lot of patience. 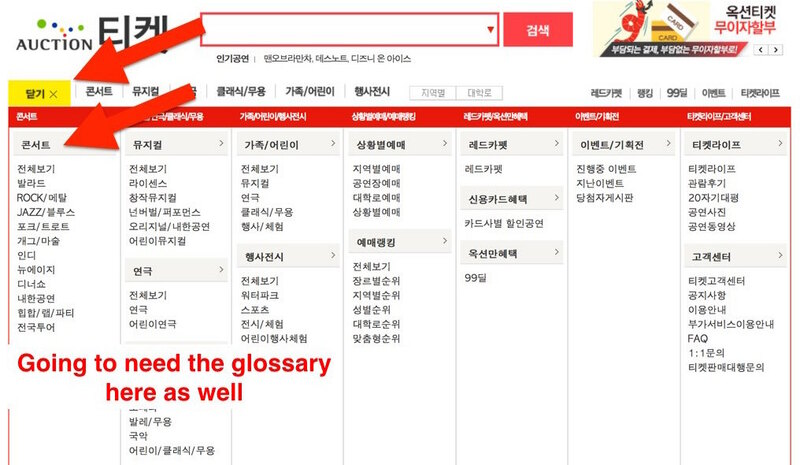 I have made a glossary of terms for ticketing sites to make your search easier. If you have any questions or want me to search for an event just let me know by messaging me. I’ll show you where to check out concerts and events happening in Korea. Some sites have exclusive rights to sell tickets to certain events, so you might have to check a couple sites to find the event you’re looking for. If the tickets are all sold out, don’t worry. I will show you the second market too. If you already know the event and some details you can simply hit me up on chat or give me the details via the forms and I will check ticket availability and prices for you. Tickets Tip #1 – Popular concerts sell out in only a few minutes. Most times we can only get 4 – 8 tickets per concert and even then it takes a bit of luck. If you want use to purchase tickets to a popular concert please request the tickets as soon as possible because I allocate tickets on a first come first serve basis. 1. Interpark Tickets – Korean site link – English site. These 2 sites are not connected. English site has very limited options. Make sure to click the event and choose the date you want, that way you can see the number of tickets remaining. I’ll help you buy tickets and I can give them a call and double check if they’re sold out for you buddy. I’m going to click concerts “콘서트” and then check out Rock. Once you find the event and tickets you want 1. 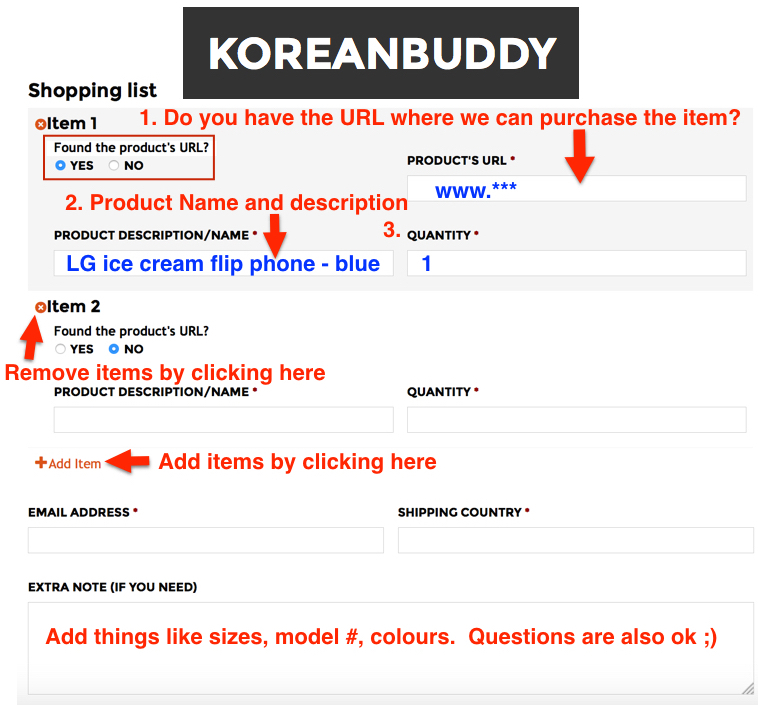 Copy and paste the URL into our order form on koreanbuddy.com. 2. Copy and paste the concert title. 3. Fill in the date and time you want to go and 4. Let me know the number and type of tickets. If you have any questions just contact me through the chat. 2. Yes24 – They sell all kinds of events tickets. You can search for a band in English as well. 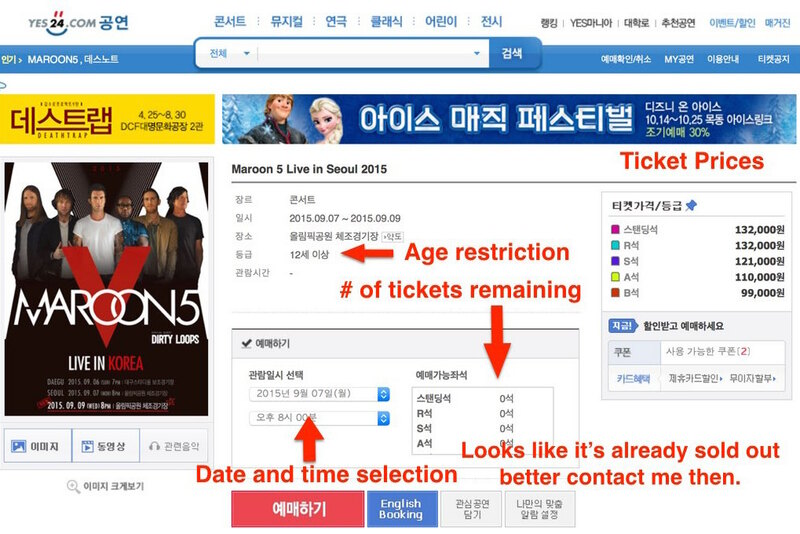 Looks like Maroon 5 is coming to Seoul, Great! I’m going to click on that. Looking below, I checked both dates with the first drop down menu in the date and time selection area and it’s already sold out! 0석 means there are 0 seats left. Both dates were sold out, so I really need to contact KoreanBuddy for help now! Again, once you find the event and tickets you want 1. Copy and paste the URL into our order form on koreanbuddy.com. 2. Copy and paste the concert title. 3. Fill in the date and time you want to go and 4. Let me know the number and type of tickets. If you have any questions just contact me through the chat. 3. 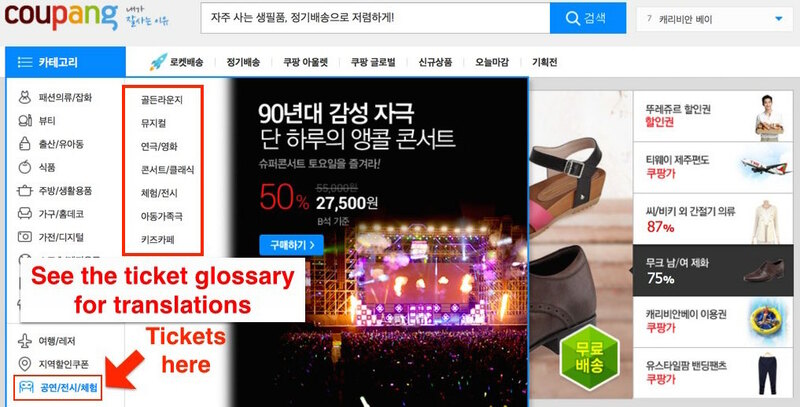 Auction.co.kr – This is your typical crowded confusing cluttered Korean shopping mall site. I suggest clicking on red arrow on the far left of the main menu. This is the “view all” categories feature. A large menu with all the categories will drop down and you can pick the specific type of event your looking for. Use the ticket section of the glossary to translate some of the categories. 4. Ticket Monster – Discounts on tickets to attractions in Seoul, children’s events, musicals, exhibitions all on a very well laid out easy to browse website. There is a top 5 popular list. Each event has it’s own box you can click on and at the bottom of each box there are notes such as 바로사용 – can use immediately 오늘마감 – Sale ends today and 오늘오픈 – On sale from today Start by clicking “컬처” culture on the main menu. 5. Coupang (Tickets)- A super popular website that offers discounts on all kinds of tickets. Very similar to Ticket Monster. They also have a top 10 popular tickets list. 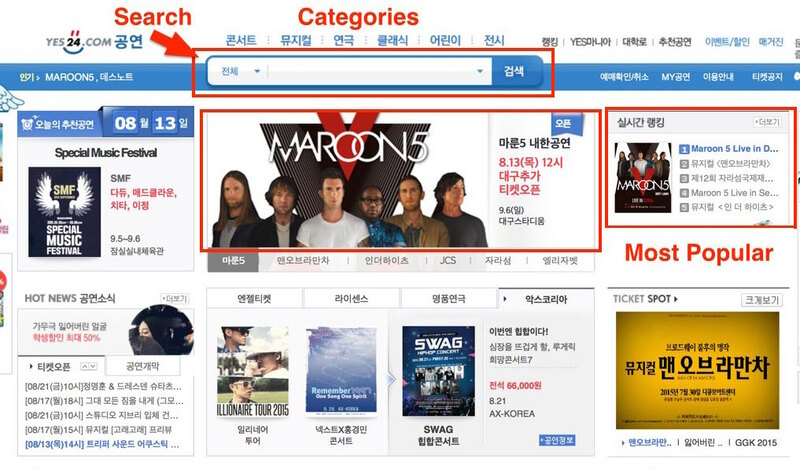 If you get lost on this site, keep going back to the blue box on the left of the main menu “카테고리” categories. The menu will drop down and the last option is event tickets. From here you can use the glossary to find the sub category your looking for. 6. 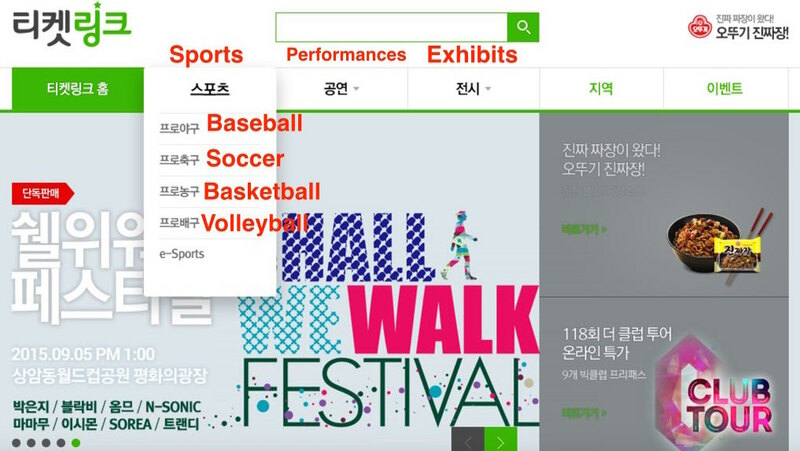 Ticket Link – great place to find sporting events tickets to all the Korean professional sports leagues. All The details of your favorite teams upcoming games. And professional sports tickets aren’t as expensive as you might think. I’m going to click on baseball. 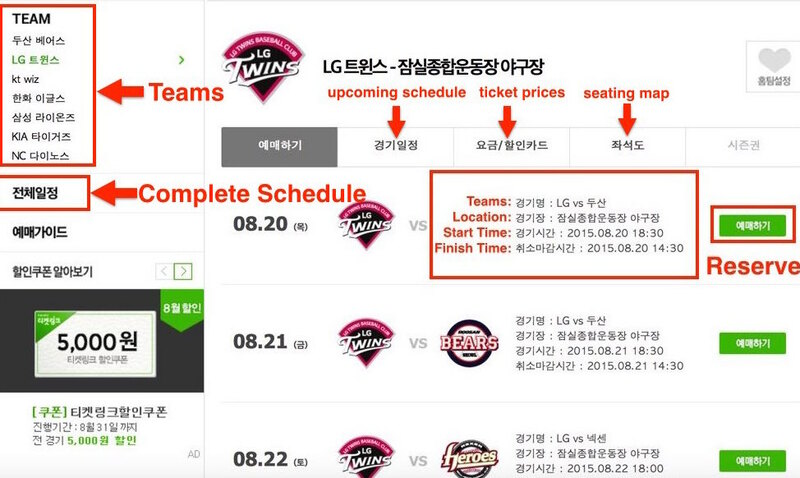 Now you can choose the team, see the league schedule, view ticket prices and see each stadium’s seating map. 7. Ticket Bay – Is the concert you wanted to go to sold out? 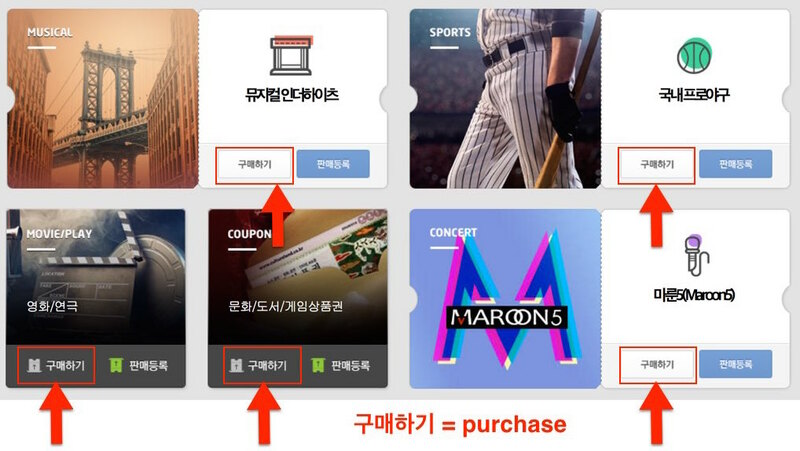 No problem, Ticket Bay is the second market for tickets to events in Korea. 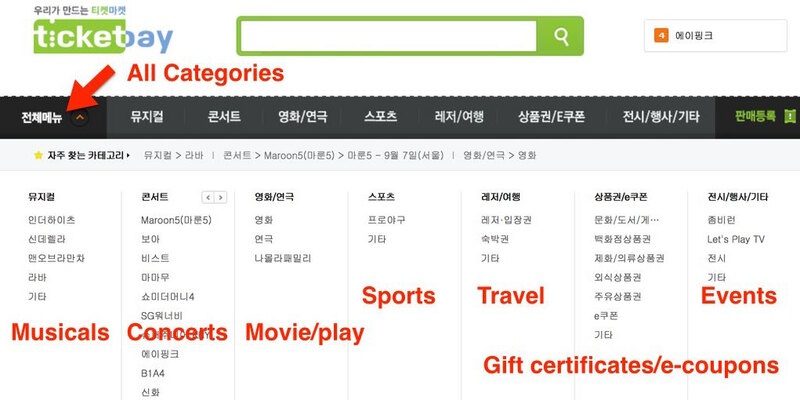 Scroll down a little to see the categories in English. 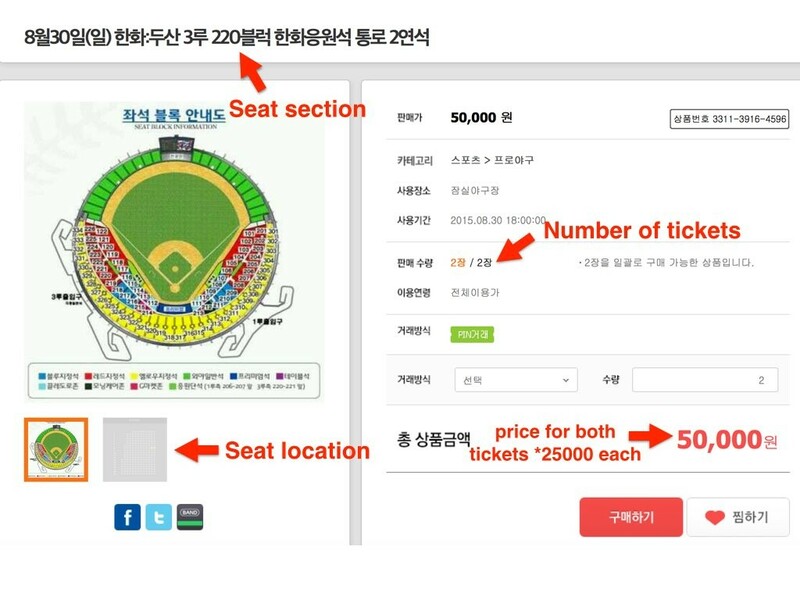 Click the ‘구매하기’ (purchase) button so see the tickets for sale. ‘판매등록’ is register to sell for those who are interested. Expect to pay above face value for popular shows. This is where the real fans are separated from the casual fans. Or where the casual fans didn’t know when the tickets went on sale and now they have to buy them on the second market. When you click on a listing you can usually see the specific location of the seats at each venue. The price listed here is the total price, however the prices on the listing pages are per ticket. Usually when you buy tickets like this you receive a QR code, bar code or some other kind of code via email or SMS. 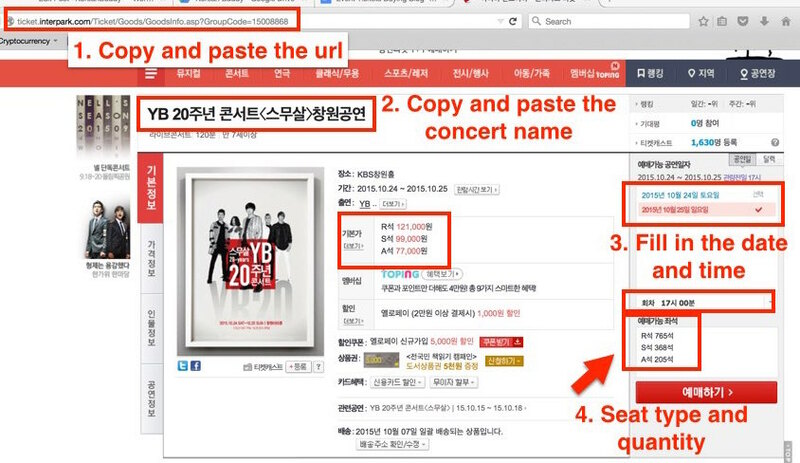 If you find tickets you like, just copy and paste the URL into the forms on KoreaBuddy.com, and copy and paste the title of the post.